A 2006 study in Scientific American Mind magazine said that on average men cry X times a month and woman cry Y times a month. Take a guess on the numbers and see how close you are (answers below). • Share the tears. Crying brings us closer together. In these anonymous days of gated communities, big-box stores, and rampant Interneting, sometimes people just need the attention and care of a friend. I mean, when you see your pal crying, what happens? Maybe your eyes well up and you throw them a hug. And maybe that’s exactly what they need and why the tears poured out in the first place. • Body buzz. Studies show that emotional crying (versus dry-eyes crying, onion crying, or eyelash-in-your-eye crying) actually releases a bunch of wacky hormones that relieve tension by balancing your body’s stress levels. If you’ve ever heard people say ‘I’m okay, I had a good cry,’ then it could be because crying helps straighten out your chemically crooked self right when you need it most. And let’s face it — that’s a lot better than holding it all in and shorting out all your inner circuitry. • Hey, I just crapped my diaper. 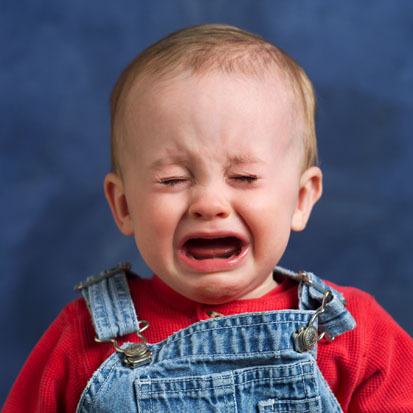 Babies cry before they talk, to let us all know when they’re tired, frustrated, scared, in pain, or when they really, really, really want their video back on. The point is that crying is a primal, universal way to communicate and sure does tell us when something’s up. Way to program that into us, God and/or evolution. Yes, even though men only cry once a month on average and women let them pour five times or more, there’s room for tears plus, people. So don’t hold back because you think it’s embarassing or a sign of weakness, no. When memories of lost loved ones flood back or painful experiences hit you hard, I say just let those big, wet tears rain down without any guilt or shame. Because we all need to let go sometimes. This post was indescribably appropriate for my life right now. You are right, sometimes, we all do need to let go. Finding a blog post that perfectly describes your emotional state? AWESOME! i guessed 1/month for men and 10/month for women. 1/2 is a passing grade, good enough. I love the Scientific American Mind! I guessed 2 and 4. Not too bad, eh? yet another consistently AWESOME post. yeah, that’s exactly what i was thinking. i always thought i cried more often than most women, but i don’t even come close to 5 times a month. i think there are just some people who cry several times a day, and they skew the data. Oops. Sorry. That was me! Same here. If I cry once a month I feel like I’ve cried too much. yeah, i was thinking, hmmm, maybe 0.5 for women and 0.1 for men? why bother with months, why not years? gosh, the average woman cries FIVE times a month? im like, not even 1 maybe. But then again,The Curse like girls do. So true… I’d like to read that survey now…. Tom, are they maybe of British decent? You know, “Hanging on in quiet despiration is the English way” and all? What’s not awesome? Crying like a baby throughout your entire wedding ceremony, from the moment you see your bride start heading down the aisle. 1) It makes it pretty difficult to get through your (carefully written) vows, when you’re near-sobbing and no one understands what you’re saying. 2) This moment will forever be documented in pictures by everyone in attendance. And they won’t have any where you aren’t red-faced and bawling. 3) Your lips will taste salty for the whole “kiss the bride” thing from all the tears. Well, uh, or so I’ve heard. Not that I’d have any experience with that or anything. Dude. You’re a real man. I was born without the male fast car gene, but compensated by getting female lacrimose gland gene. Lucky me: cry at bad movies, mere site of Barack Obama, anything involving ’04 Red Sox, & cute kids, not to mention bad stuff. Great way to slough off stress, highly recommend it. Oh, I’m a bit surprised. I guessed 5 for men and 20 for women. Maybe that’s cause I cry so much. I know I’m super emotional, maybe a bit too much actually. But nowdays I can control it pretty well so I don’t cry public so much anymore. It’s sometimes confusing for others if they don’t know what to do. But if you’re stressed and exhausted it really helps. Sometimes it doesn’t but yes, it always feels better than trying to hold it. Great piece. I’m 22 and in college. I guess I am not the typical guy as I seem to cry more than once a month. Sometimes more like once a week depending on what’s going on. They are not always crying my eyes out kind of cries, although I am doing that now as I type this. I totally agree about crying together. My girlfriend and I do it all the time. We have even cried ourselves to sleep in each other’s arms before. Again, as I said, nice piece. guess i’m not “normal” in this regard. i cry 4 or 5 times a week. sometimes i get my weeks worth in in a couple of days…lol…or even one day. if i wasn’t in school i’d be crying right now. crying is a great stress reliever. i don’t know what i would do if i couldn’t cry when i get stressed or overwhelmed. just a couple more hours and i will do just that. I love crying lol it just feels soooo good. I also like screaming really loud when I’m angry works quite well. I’m not embarrassed about crying, but honestly, how can women cry FIVE TIMES per month on average?! i would have problems finding that many things to cry about! Easy. I cry at movies, stories, interviews, reunions on tv, commercials, when I’m scared about school, frustrated, feeling really blessed/lucky, etc. It’s not always something sad. I think some people are throwing the odds by crying all over the place. I grew up in a family of five girls, one boy. I don’t think any of us cry more than once a month. This is one I have to disagree with. I hate crying and never feel good after doing it. And I’m a woman, for the record. I cry 3 times a year, tops. Oh, I cry way more than five times a month. Whenever something great happens, I cry. Whenever I am mad, I cry. Whenever I am sad, I cry. When I read a sad story, or a heart-felt story, I cry. I cry when I’m tired. Sometimes, I cry for no reason…it just happens. And when the tears start flowing, there is no stopping them. Most of the time I feel great after. Other times, I feel more tired and I can’t breathe. Sometimes, crying bothers me, not because I’m crying, but because, for some reason, it’s always stupid, little stuff that triggers it. I take the ‘big deals’ in stride and cry over spilled milk. >.< It seems to be a case of 'the straw that broke the camel's back.' But oh well. I still feel world's better after, and there's been a time or two I'd force out the sobs just so I could get rid of the excess, nervous energy. Nothing like a good cry and the subsequent sleeping it off. I don’t think i cry more than about 3 times a year. Should i be trying harder? also what font is this, i love it! That’s what I’ve always thought. Crying is a way to relieve stress and tension and bad feelings and even sometimes, good feelings. Great post! After having a bad day, I come home and read this post. It always makes me feel better. Thank you. whew! I thought I was abnormal….i cry at the regular stuff – like movies, weddings and funerals – but when i get all teary at commercials, personal stories, some newspapers articles, etc, I try to hide the tears cause i feel people will think i’m weird. Glad to hear there are others like me! Thank you. Not crying takes years off your life. If you feel the urge to laugh, then laugh. If you feel the urge to cry, then cry. The only people who’ll look down on you for it have problems, so feel sorry for them and go on being a human being. I cry more when I’m deeply moved (by a song or poem or film) and when I’m angry than when I’m sad. I cry, didnt used to so much. It started when I was younger and went to juevenile detenention. I didnt cry when I was with other inmates, I kept a cold steely exterior. However when you see you dad cry during a visit its pretty emotional. He visited me everyday and everyday I had to fight back tears. Now our father son relationship is stronger than ever. Since then I cry alot, sometimes more than once a month some times less. If things in life ever seemed like too much, I would just sit in the bathroom and cry. I always felt better. Thank you for writing this blog, I’ve thoroughly enjoyed it. i think the numbers probably have to do with what u consider to be crying i mean balling your eyes out is more what i consider crying and that would be a once a month thing on average but u occasionally see something on the TV, Net, or in real life that gets a tear or 2. i wouldnt say its crying but their certainly a lot of emotion in it. anyway i have to agree that letting these emotions out is a good thing for u and ur mental health. What about the moment you STOP crying? I think that’s equally awesome too. Like after you bawled your eyes out after being crushed by some unbearable load and then one day, the tears stop and you start being okay. i took my son, age nine, and some of his friends to a movie he wanted to see. my son would not sit next to me as his friends were there and he needed to look strong. as the end of the movie came up, and the hero was going to die, i started to cry, not loudly, just tears falling from my eyes. my sons best friend, who was sitting next to me said, “Ian your dads crying”, my son said to his best friend, “oh, he always does that”, and i was glad to be the Daa that cries, before these future Daas. there is no shame, only love. Um I just started crying (although it was coming on for a while, and I ended up here because this site makes me happeh). Thank you! I am really late on this, but I was just thinking about that the fact that I haven’t cried in so long, and I thought about this post. I’m a teenage girl and I definitely don’t cry 5 times a month. It sounds weird, but I actually rather miss it. Love this post…I’ve been reading through the blog over the past couple of days, and I’ve been crying off and on since your Mother’s Day post (can’t remember what number it was) about hanging out with your mom…my mom died 12 years ago and when I read that post I just broke down…and I cried again when you referenced this post in your #567 post about Getting to the light at the end of the tunnel…yes, a good cry is therapeutic…I’m extremely emotional and cry over almost anything…happy tears, sad tears, mad tears, frustration tears, exhaustion tears…all kinds of tears…reading your posts and the comments here let me know that I’m normal, even though everyone in my immediate circle think I’m a basket case. :) Thanks for putting this blog together, Neil…it’s the little things in life that really count. Thanks for the exceptional facts covered throughout your site, what follows is a small question for your blog followers. Who stated the following quote? . . . .Of all the gin joints in all the towns in all the world,she walks into mine. I’ve had chronic kidney stones since considerably young ages; some being enormous; others strung together! Conventionals miffed~I became a study. I glow in the dark now from procedures, although grateful, for required interventions have saved my “physical” life. Then a dear friend recommended I see an Authentic Traditional Chinese doctor, so I did. Herbs were prescribed; some foods to eat less and some more of. The cost, unbelievably low! So happy to help be well. I read “Unattended Sorrow”, by Steven Levine and visited the pain~ wept. Now, stones smaller, less frequent; everything more manageable. Kidney stones should be avoided at all cost. We’re not made of stone, so pump up the volume from core and CRY, then walk and call a true friend. Wow, I never would’ve guessed that average. I don’t think I cry even once a year! I don’t remember the last time I cried. Maybe I have faulty lacrimal glands.